Distributor Funimation have spent the past couple of weeks revealing their latest line-up of anime for their simuldub streaming service. As the list of titles incoming comes to a close for the season we now have the dates and times for when these will be available on the service. For those who aren’t aware, a simuldub is when a currently airing anime series is being made available as soon as possible with an English dub. It’s basically like a simulcast but for English dub viewers. The English dubs do take some time so they arrive a few weeks after the original Japanese broadcast unless the production was done really early (as seen with Kyoto Animation’s Violet Evergarden for Netflix which is being simulcast with both English & Japanese audio options available weekly for the UK & Ireland, more info on that here). Also worth noting is that Funimation’s streaming service will be English audio only so if you want to view the original Japanese audio with English subtitles it will be over on Crunchyroll, as part of their Crunchyroll x Funimation partnership. You can view the Crunchyroll line-up here. Sold at an auction, Chise Hatori has little hope for a better life until a sorcerer takes her in as his apprentice—and his bride. Only ten years have passed since the battle between clans. Poised to fight once more, a new generation now stands at the forefront. In a world where magic is everything, the next Wizard King could be a boy without power. 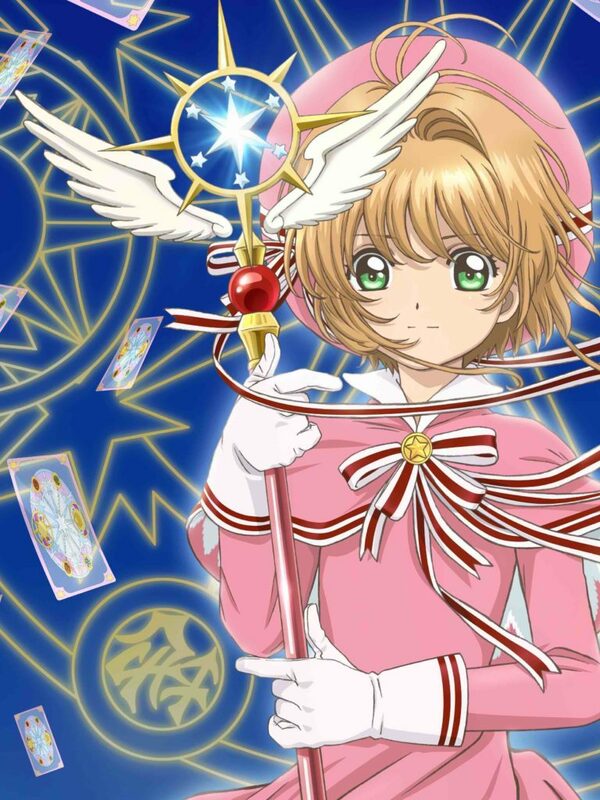 The power of Clow is back with a new adventure for Cardcaptor Sakura! Mysterious blank cards and new magic await the guardian—is she ready? Fashionable Yuzu’s life goes from sweet to sour when the beautiful but stern Mei falls into her life. Hotaru and Kokonotsu return with a bounty of tasty treats to try! Join them in the exciting season two of Dagashi Kashi. When fallen FranXX prodigy Hiro meets Zero Two, the girl with horns, everything changes. Stuck in a fantasy RPG, Suzuki Ichirou quickly achieves a high-level rank and spends his days in peace. But a demon king stirs up trouble. Sword seeks to expose the shadow war in his city, Sophie searches for her missing brother. Both chase their only clue—El Dorado. After losing his clan, Taikobo is put in charge of the Hoshin Project: a mission to seal away the evil immortals that infest the world. In the seedy underworld of a peaceful city, a so-called “killer of professional killers” is becoming more than just an urban legend. Witness the most hair-raising stories from Junji Ito Masterpiece Collection and Fragments of Horror like you’ve never seen them before. If you blush, you lose. Nishikata has been teased mercilessly by Takagi and always winds up blushing! But he vows to one day get back at her. To protect the world from supernatural beings, shrine maidens spend their days honing their swordsmanship at five special schools. After getting trapped in his favorite MMORPG, Momonga decides to use his high level and devastating powers to try and take over the world. High school students and pro-level gamers Riku Suigin and Riku Rei are about to get swept up in an RPG unlike any other. The crew of the Space Battleship Yamato will stop at nothing to save humanity as they travel across the galaxy through alien enemy lines. Protecting history is the task of a group of legendary swords brought to life, complete with unique personalities and charming daily lives. We expect The Disastrous Life of Saiki 2 to also be part of Funimation’s catalogue so we’ll update the article when that gets licensed.